Simple AS2 Certificate installation for VANS. This is when you can’ get it to work, the below should work if followed step by step. *If you are using Active Directory Certificate Services you can TRUST the AD without having to load this locally, this quick setup will work on load balanced BT servers, however this specific instace for TRUSTS is for local single machine installations. *Check that the serial number in the PFX P12 (personal key ) DOES NOT start with a 00. Create one user for the Inprocess and the isolated host adapters, add them to the Biztalk administrators group and local Administrator group. For this example we will call it BTAS2User. You will see your personal certificates available here. It should work if you just restart the host instances, however I rebooted since it was a "pre-production" server . AS2 Certificate MDN’s Force response Setup. Error Code: 0x80070005, Access is denied. I went and tried to open up the main homepage for the ESB 2.1 Management Portal and low and behold it didn’t work. Though up to this point I had been winging it with the guide and search engines, so I had to rethink many of the prevous installation steps. I found that my application log was litered with 1 single call. Low and behold there were access errors, and after a long day of creating different log ins and trying to keep track of this I knew this wasn’t going to be a 5 minute fix. Though, as seen in yesterdays blog I did this yesterday as well, but hey the . was back for my local user which was the user I had used for many of the configuration settings. My Main user was an SSO Admin. This only left me with a "Application does not exist," which I covered in the previous post. I have yet to find the reason why esb.exception handling doesn’t get added when the rest do. 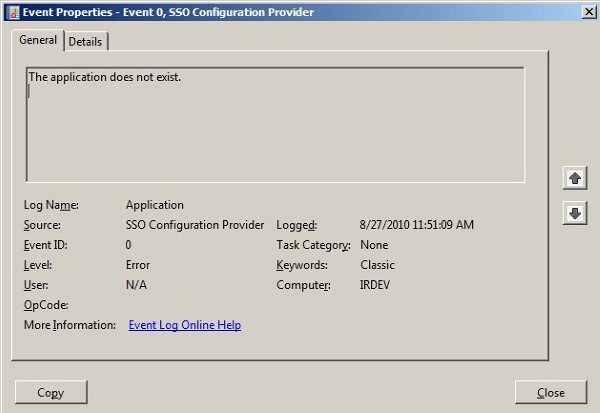 The "work around" has been to remove it from SSO and use a "File Configuration like so"
This below not fix the SSODB problem, it does however fix the error from arising when trying to navigate to the portal home page. Error Code: 0xC0002A04, The application does not exist. This led me to think ESB.exceptionHandling belongs in the SSO DB. Actually the above was just another error that triggered an exception which caused the SSO to get hit for the esb.exceptionHandling application, and it wasn’t listed in the SSODB . I even just tried adding ESB.exceptionHandling and adding the row to the DB manually. After I received an Incorrect Parameter error. I created a dual boot machine ot throw 2.0 back up to see if it was added during 2.0 and it isn’t. I had originally created individual web sites for ESB Web Exception and Core Web Services. Originially these had bindings that weren’t the same as the default website. This was due to the fact that each site had it’s own Bindings and the sites were expecting these to be in the same binding set. I still need to research if this is due to relative path calls (so they would have to be on the same bindings) or some configuration file that is used reference the call, that can be changed. After the esb portal came up fine. 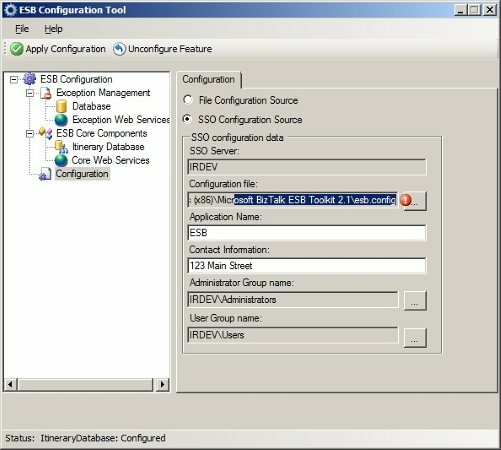 You more than likely kept the ESBSource directory when copying over. You sill still get the red flashes in your command window. Bm.exe deploy-all -DefinitionFile:"C:Program Files (x86)Microsoft BizTalk ESB Toolkit 2.1BamMicrosoft.BizTalk.ESB.BAM.Exceptions.xml"
Bm.exe deploy-all -DefinitionFile:"C:Program Files (x86)Microsoft BizTalk ESB Toolkit 2.1BamMicrosoft.BizTalk.ESB.BAM.Itinerary.xml"
Start SQL Server Analysis Services (MSSQLSERVER). DCPromo kills test BizTalk box. I needed to run a test to generate a certificate using certificate services, so I had to run my local server dev box as a Domain. I had to add directory services through the server manager. I ran the DCpromo. I ran my certificate tests and proved what I needed to. Up until this point everythign was done well. However after I was done, I wanted to get back my original user information and test box. So I DCPromo’ed again, removed the domain and assumed my user would revert to my non-domain "Users" folder. However once you do the DCPROMO up and back the User ->User mappings fail (this was the same error SQL kept giving me). SQL wouldnt even start anymore and the repair failed. I can’t log into Biztalk and the Biztalk Groups are missing from my local computer managent- User management. Note to self: Dont mix to many different kinds of tests. This is leading me to completely reload the box from scratch, since I was having issues installing the 2.1 ESB tool. THis is probably a better approach. On Friday I should have a step by step "building an ESB 2.1 Box from scratch"